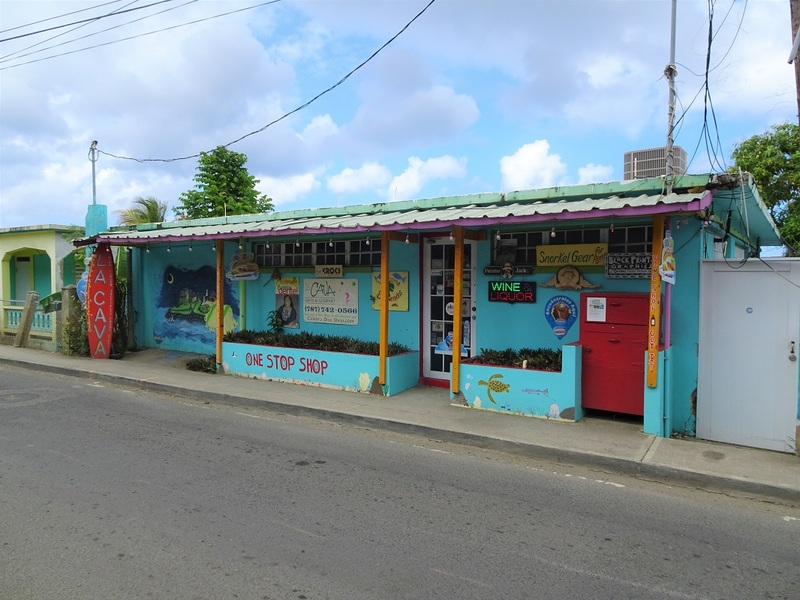 Tuesday 26 Mar, SVI day 1, Culebra: Check out of USVI, lovely sail to Culebra SVI and evening out at Dinghy Dock. First thing after breakfast we take the dinghy all the way across the choppy harbour to the ferry terminal to check out. Needless to say, we get quite wet during the long and bumpy dinghy ride. Once there we find nowhere to tie our dinghy to. How silly not to have a dock next to CBP (Customs and Border Protection). We try the small marina nearby but they want $10 to dock a dinghy. We are not playing that game. So it’s back across the choppy bay to Kingswharf where we tied the dinghy in the last few days and walk along the waterfront to the ferry terminal. Checkout, thankfully, is not busy and the procedure straight forward despite having to fill in the same form which we already completed when we checked into St.John. Back on Cloudy Bay we don’t hang about. As we raise the anchor and start to motor out of the harbour a cruise liner is coming in. We of course give it a very wide berth. They appear to have thruster props both bow and stern making maneuvering pretty easy it seems. 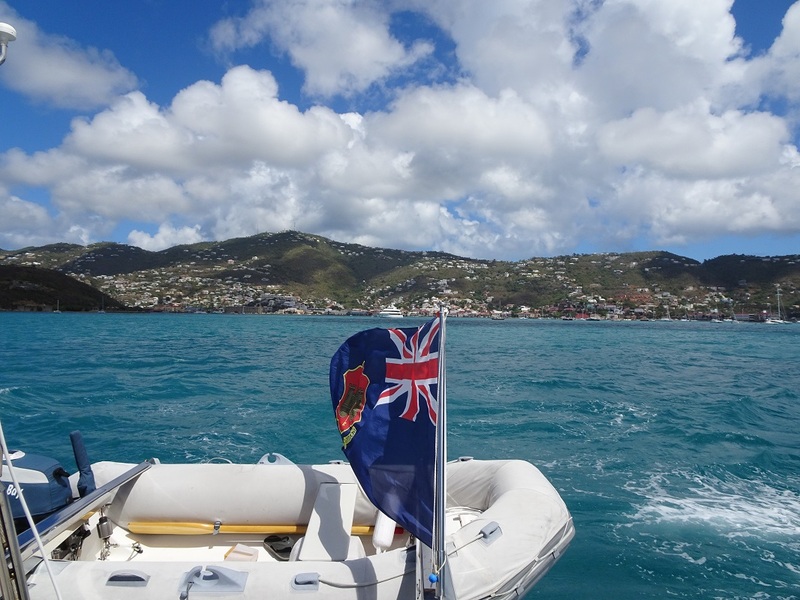 Rather than heading direct out passed Water Island we instead motor behind it, for 2 reasons. First it lets us have a closer view of this part of the island and second it will give us a better angle, by about 5 degrees, for our passage to Culebra. It’s a broad reach and that extra 5 degrees means the genoa will be filling OK, rather than floundering behind the mainsail. With both sails fully out and a true wind of 17-21 kts at 130-140degrees off our port quarter, we are thundering along at 8-9kts. A really nice fast sail at the perfect angle to the wind. And the swell isn’t bad either. We pass a smaller yacht, which is sailing in the same direction but only with genoa, like it’s standing still! Half way to Isla de Culebra we pass Sail Rock, a jagged piece of rock 40m high. Which could, with some rum powered imagination, actually look like a sail. 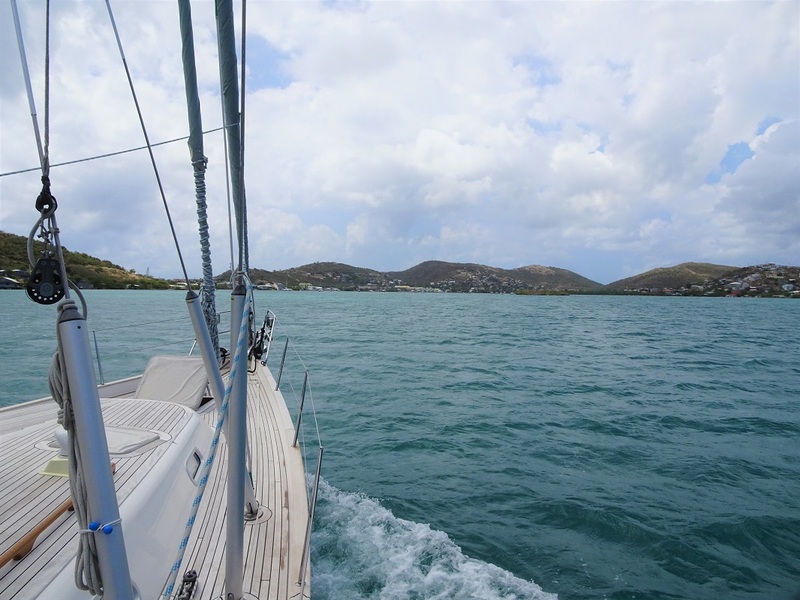 The 20nm go very quickly and our comfortable and pleasant sail ends way too soon. Early afternoon we arrive in Culebra. We are aiming to anchor in Ensenada Honda, a deep protected harbour on the SE side which is next to the small and only town. Here is where we have to check in. The approach to the harbour is through the narrow Canal del Este, which is flanked by many reefs and shoals. So we have to take it pretty carefully. After a few moments when our depth sounder reads 6m instead the 11m marked on the chart, we decide to furl the sails away and motor through the channel rather than gybing back and forth. As we pass through the narrow but buoyed entrance, reefs are on both sides, just exposed above the water. On the south side several yachts are anchored directly behind the reef – in the strong and cooling breeze, but very much sheltered from the waves by the reef. Clouds are covering the sky more and more so our approach of Culebra is not in the most glorious colors. Even without the sun we can tell the island is very dry. There are quite a few boats anchored in the bay by the town, and no charter boats for once (at least none that we can tell). There is plenty of space to anchor and we pick our spot. There is a nice breeze through the anchorage, but no swell coming in, just a bit choppy due to the wind. So we have another wet dinghy ride ashore. The only proper dinghy dock that we could spot is at the Dinghy Dock restaurant (very aptly named). A very good looking place and when we get there lively with yachties having lunch. For our check-in we have to walk all the way through the small town to the airport. Well, airport? It would more appropriately be named air field. It’s a tiny landing strip with the tiniest of terminals. As this is our check-in to the real USA we are a bit nervous after our treatment last time we checked in, in St. Augustine, Florida, last June. But we need not have been concerned. The young CBP Officer could not have been more pleasant and 20 minutes later we emerge not only checked in but also with our 1 year cruising permit to the USA. This will make our entry to the mainland extremely simple. Just a phone call. Wonderful! We wander more slowly back through the town, inquiring on the way about golf-cart rental. Only $35 for an 8am-5pm hire. Not bad at all! The ambiance of the town is quite different to previous islands. We are definitely now in Hispanic islands. Everyone is laid back and very friendly. Older men are gathered in small groups here and there just passing the time of day, just as you would see in Spain or Greece. And best of all, no heavy drinking, smoking dope or loud music like the other Caribbean islands. Here the word “peace” would describe it very well. The houses are all brightly coloured, as if to reflect the spirit of the warm people. And there is a distinct cleanliness about the place. After eating a very late lunch on board we head out again to see more of the town at dusk. This time we walk along the little high street to the ferry terminal. At the end of our stroke we end up having a drink in the dinghy dock bar where, swimming among the yacht tenders are lots of huge Tarpon fish. Each about 1m long. Diners occasionally throw leftovers from their plates to the fish which scramble for the food in such an aggressive way that they splash water into the adjacent dinghies. Even a whole fish head, bones and tail disappears in 1/2 a second! Staying on the fish trend, we get glued for a while to the TV screen, where they play videos of spear fishing by scuba and free divers. Amazing. Maybe that’s how we should fish! At least I can select what I catch! One of the videos is set in Indonesia and we are mesmerized by the beauty of the islands, the tropical water and amazing reef. And all of a sudden we are super enthused about getting Cloudy Bay to Asia. It’s going to be a highlight for both of us … and Cloudy! The remainder of the evening is on board relaxing after our busy day. Late in the evening we hear from our friends Christian and Eva, the Captain and crew on s/v Gale, the Swan 66. They are planning to come see us on Culebra tomorrow. Brilliant! We will have a golf cart day with them and maybe anchor together in some of Culebra’s amazing bays.